One of my favourite blogs to visit is Deb's Dust Bunny, it's a delightful place full of delicious recipes and interesting information all served with a dollop of good humour. 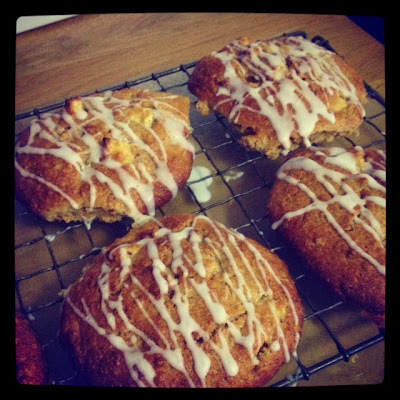 Last week I spied Debs recipe for Cinnamon Apples Scones, it's one she posted last October, how did I miss that! These are not the usual kind of scones I would make, they are more like American Scones much sweeter than our and iced on top. I was really drawn to them and had a go at making the scones, as you can see above. 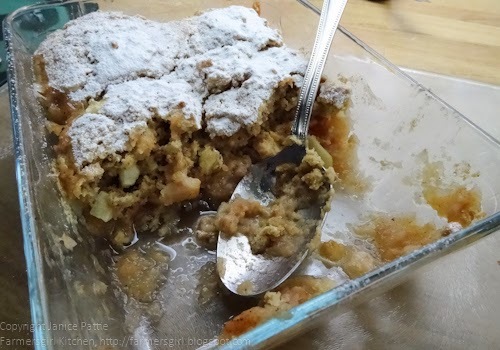 However my mixture must have been too wet as they spread rather too much but were still totally delicious and I liked them so much that I thought the mixture would make a really good cobbler topping. 1. Place the sliced apples, sugar and water in an ovenproof dish and cover with a lid or foil and place in the oven at 160C for about 20 minutes until the apples are softened but not disintegrating. 2. Put all the dry ingredients into the bowl, use a knife to cut in the butter, then rub in with your fingers. 3. Beat the egg and yogurt or milk together in a small bowl. 4. Add the liquid to the dry ingredients and mix until only just combined, do not over mix or the scone will become tough. 5. Remove the cooked apples from the oven and place large spoonfuls of the mixture on top of the apples. 6. Increase the oven temperature to 200C/400F and bake for 15-20 minutes. The scones take only 12-15 minutes but I found that the depth of the topping meant it needed a little extra time. Dust with icing sugar and Serve with ice cream or custard. 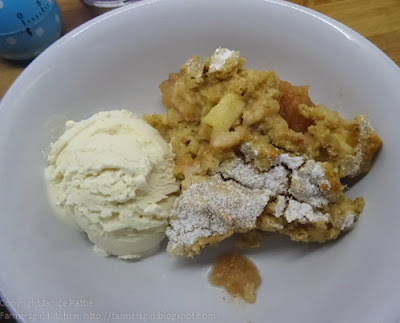 This was very good, the apples in the topping give a surprising texture and the cobbler was crispy on the top and softer where it met the stewed apples. It would be good to try with ginger instead of cinnamon. Many thanks to Debs for giving me permission to recreate and re-purpose her recipe. I'm entering this Cinnamon Apple Scone Cobbler into Bookmarked Recipes, the blog event hosted every month by Jacqueline at Tinned Tomatoes. Haven't made a cobbler in more years than I care to remember, but yours sounds so good, I might have to revisit. What a good idea, looks really tasty & I like the idea of trying ginger. A LOVELY recipe and thanks for a new blog to discover too! Thank you for all the lovely comments, it's definitely a winner of a recipe. Custard for me please Janice! Thanks for submitting it to Bookmarked Recipes. The roundup is late, but now live. Better late than never!